Transfer propaganda is a technique used to project values, positive or negative, on a person, concept, or image. In some cases the 'propaganda' element is implied through traditional values like nationalism, rather than contemporary, but in most cases the intention to give a value to the object or person concerned. Generally the process is two sided, one side using a person as a positive value, the other as a negative. 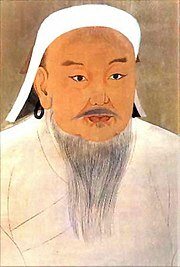 Portrait of genghis khan produced by a chinese artist at the imperrial court.